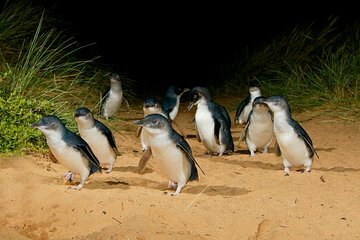 Auf dieser Kleingruppentour von Melbourne nach Phillip Island können Sie die heimische Tierwelt Australiens beobachten, einschließlich der nächtlichen "Pinguinparade". Gehen Sie zuerst zum Moonlit Sanctuary Wildlife Conservation Park und beobachten Sie Kängurus und Wallabies beim Spielen. Genießen Sie die atemberaubende Aussicht auf die zerklüftete Küste von Phillip Island entlang des Nobbies Boardwalk. Anschließend fahren Sie zum Summerland Beach, um eine Prozession von kleinen Pinguinen aus Victorias größter Pinguinkolonie zu beobachten. Wonderful to see the tiny penguins up close! Slightly windy by the shore. Knowledgeable tour guide. Dont miss the penguin parade! One of the great experiences of our Australian trip! Very good Itinerary. The wildlife tour was great, we got to see a field full of kangaroo's and the penguins were so fun to watch coming out of the sea. They don't come out until dark, and can be hard to see, I recommend taking some good binoculars. Also no camera's are allowed when it gets dark as the flash shares the little ones. Una jornada muy completa, disfrutando primero de la reserva de animales en las que vimos canguros, wallabees, emus, koalas y mucho más. Y después con la puesta de sol culminando con la salida del mar de los pequeños pinguinos de Philiip Island. El guia estuvo muy atento durante todo el viaje, dándonos mucha información de lo que íbamos a ver. Y en ambos sitios se respira un gran respeto por los animales y el interés porque los visitantes puedan disfrutar al máximo de la experiencia del contacto con la naturaleza. it was a nice day, the guide gave a lot of informations. great time! The Tour was amazing. Our bus driver PHIL was lovely and very informative throughout the day. The penguins did not disappoint. I would definitely recommend this trip to others as it was a good way to see a bit of the Victorian countryside as well. Worth the money. Very nice day with an excellent caring guide. The penguin were great and the driver was knowledgeable, unfortunately the shuttle van was in terrible condition. The door kept jamming and worse the driver had to keep pulling over to burn off the debris in the Fuso buses Eco Filter to avaoid a break down. Not fun having to get out of the bus in 35 degrees in high wind at night.